Reviewing books is not easy. As an author myself, I understand our need to personalize a lot of what we write, to come across as an ‘expert’ on the subject, to confirm and back up our claims with relevant research, and to make sure that we point out our own experience and growth (especially if this is our second or third book within the same theme). It is difficult for me to review any book, and a task made more difficult by the fact that I liked a previous text written by the same author. Pete Jennings’ book Pagan Paths was one of the first books I bought when I left Wicca. He had a lot of information about heathenry and that for me was a good starting point. Jennings is a very good writer. He can convey information in a simple and very practical way without being boring; his research and findings are sensible. In fact, sometimes he is downright funny. With this book though, I have to say I found myself wondering about a lot of what he was saying. For me this book, Heathen Paths provided a solid introduction to Anglo Saxon Heathenry which still fascinates me a bit, due to the fact that I don’t quite understand it … so a book specifically on this subject was of great interest to me. 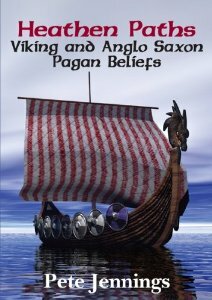 I will say that Jennings did a fantastic job of giving the reader a complete overview of everything to do with the history, culture and background of Anglo Saxon heathenry. But, there were a few points after Chapter 8 where I found myself actually getting quite confused. I found myself questioning why Jennings interpreted certain ancient passages in certain ways, and why he constantly keeps throwing in the term “paganism.” Granted, the title should have prepared me for that, but I did not expect certain arguments to be presented and was surprised when they were. Like his argument for witchcraft! Yep, you heard me, witchcraft! Now, I am not saying there was not some version of witchcraft in Norse people’s lives, but I don’t think for one second that anything presented in legend actually happened. It seemed like Jennings was presenting this as fact instead of what it is. Obviously it is unlikely that some woman chanted over a dying man and it was the chant that saved him. I will still to this day say that all this was ‘show’. These women knew how to heal sick people, even save people from dying, but I will not go as far as to say it was because they knew secret chants. It is more likely that they were just extremely knowledgeable of weather patterns, herbs, and the climate of things going on that allowed them to be so proficient. So I took Chapter 8 to the end with a grain of salt; it would have been nice if he said ‘in my opinion’ more often when presenting the reader with quotations (for and against) his theories, thereby leaving you the reader to decide for him/herself. Why? Because I can see this being a thing used by too many people to give them an ‘in’ to do practices that most heathens would not do, and to me this is a big issue. It bothers me when authors conflate heathens and pagans as the same; they are not the same and to keep saying they are is frankly odd. These two paths are distinctly different from each other and don’t have much in common. There are similarities — about as much similarity as any two religions have — but I would not dare to say they are the same or think the same way about how they practice. I would also go so far as to say that constantly trying to prove the existence some kind of witchcraft in ancient Norse is a stretch. I doubt I will ever make sense of the countless references to volvas and seidhr in the historical texts as they blended with priests, wives, chiefs and kings; but someday, by Frigga’s will, I will write something about it. I don’t think they were ‘witches’ in any sense of the word nor can an author refer to them as such using only the documents written by the church. What did the indigenous Norse think of this before the Church? We may never know, as other cultures tend to exaggerate things for dramatic effect (and don’t say they didn’t). There are numerous examples of one people thinking really strange stuff about another culture mostly due to ‘propaganda’. There were several other points in the book that I had extreme difficulty reading. Jennings makes the claim that heathenry is becoming more like paganism, which made me somewhat cringe. I personally think heathenry has done more to become its own thing than join the pagan movement, but maybe that is just my own personal opinion. Additionally, I found Jennings’ comment that there is gender inequality in heathenry to be inaccurate. Mr. Jennings may not be aware of exactly how much growth there has been for heathen women. Sure, the Eddas and Sagas don’t have a lot for women, but women have been making a mark in heathenry for some time and I would argue that we are a rising force in heathenry that is not standing on the side lines. There are a few women leaders now and authors (myself included) who have written a number of books expressing the voices of women that were there all the time; perhaps we are not as loud as our male counterparts in our opinions, but there are a number of devotionals, articles, theories and such that have been written by women and accepted by the greater community. I also had issues with the constant references to Odinism that seemed to be very strongly promoting it, mentioning the leaders from that group and their offshoots. One cannot really blame Jennings for this, as Odinism is widespread. Nor does the name necessarily imply anything devious, and it could be argued that it’s just another label like Vanatru or Rokkatru, which imply the worship of one group or God over the entire pantheon. And when Heathen Paths was originally published in 2007, this was one of the “go to” organizations. I just felt that Jennings did not stress strongly enough that people should be cautious in whatever group they are exploring and he should have mentioned the many common misconceptions about Odinism other than that they worship Odin over other gods; this was not enough explanation. And again, Jennings mentions that there are few women members (although that would not be surprising if one reads the more fundamental group doctrines). I also wonder how Odinists feel about being lumped with pagans — but since Jennings identifies himself as both, I assume they are fine with it. I guess what really irks me is that he mentioned “white” in the Introduction, but took until almost the end of the book to explain his own membership; this might would lead people to conclude that his beliefs are shared by everyone within Odinism, which again is inaccurate. There are a number of very progressive and liberal heathens within all variations of heathen practice. I guess for me, Jennings just made it seem like the only movements you have to choose from are Odinist, Theod or general Asatru and there was not much mention of the groups that have developed other spiritual practices …. again though it could be just the year he wrote Heathen Paths and not much to do with any personal agenda the author might of had. Building on the above, I also found his comment in the introduction of ‘white people’ very disconcerting. This comment alone is what makes people think stupid things about heathenry that are not true, and frankly the editors should have pushed harder for that to be removed. It’s not that I am not proud of who I am, but comments like that might put someone off coming to heathenry if they think it’s a ‘whites only’ religion, because it’s not. I found Mr. Jennings comments’ on re-enacting also very disappointing. Okay sure, experimental archeology is great. It’s neat to see a Viking village, and it does make you appreciate what they lived through, but it’s not spirituality. I never felt closer to my gods just because I was wearing some costume. It’s just a neat lesson in history and should be presented as such. As you can see, I am extremely conflicted about this book. On the one hand, the book does give you exactly what it said it would. It tells you about Anglo Saxon heathenry; it gives you information about various things like seidhr, rune vikkis and such; but there is a tone in the book that leaves me a bit disappointed. Like other books, it presents this idea that Norse people were practicing ‘witchcraft,’ that there was no shamanism, and there are apparently not enough women in modern heathenry. I think if Mr. Jennings rewrote this book in 2013, he might find some differences in his opinions on things and surely find some new research that could point people in a better direction. So, for this book I can only give it a 3/5. Addendum: I think Jennings, like other authors, needs to learn one lesson (and it was one that I learned, too): we can write about heathenry, our experiences and our opinions, but most of us should not attempt to analyze history. Every book, every archeological discovery, all the evidence is all open to interpretation. Everyone will have an opinion on it. I think heathens need to present things as opinions and not as academic fact unless they have a PhD in archeology, history, ancient cultures or any of the academic fields and even than …. it should be backed up by other scholars in that field. Like science, theories need to be presented as theory. In will discuss this further in a future article. If that book had been written twenty years ago, I could laugh it off as someone looking in the wrong places, and getting mislead. Today its simply wrong, and any real attempt to look without preconception would show that. Its the latter half of that sentence that is the difficult one for many people, and authors.